I’ve just published a new creative writing course on the Udemy platform: Inspirations for Creative Writing provides a range of practical activities, ideas and prompts for poets and other writers. The course has around 90 minutes of video classes, with a range of activities and examples to download. 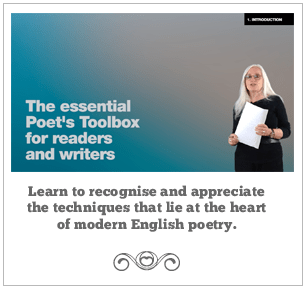 It’s the fifth course I’ve published on the site and I’m proud that The Essential Poet’s Toolbox for Readers & Writers, which has been online for a couple of years, is a bestseller. One of the things that the Udemy platform does for instructors is provide automatic captioning for the videos; but although this is a useful service, it isn’t by any means a perfect system. I think perhaps some regular readers will know that I love bright flowers. I’m sure I’ve said that salmon pink geraniums and sunflowers are among my favourites. So you can imagine my feelings when I realised that all the plants I bought this spring were white.